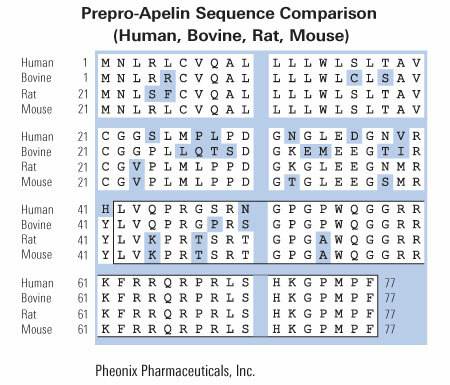 A: An alignment of amino acid sequences of rat preproapelin with human and bovine preproapelin. Conserved amino acids are shown boxed. The mature apelin peptide is shaded. Numeric amino acid positions are indicated on the right. The GenBank accession numbers for rat and human preproapelin are AF179679 and AF179680, respectively. B: An alignment of amino acid sequences of human apelin and angiotensin II. Conserved amino acids are shown boxed. C: The genomic structure of the human preproapelin gene as found in the human PAC 454M7 clone (GenBank accession no. AL022162). Nucleotide positions of PAC 454M7 defining preproapelin gene exons (boxes) are shown at the top. The ORF is shown in black, with the nucleotide positions of the start and stop codons shown at bottom. Lee et al. J Neurochem. 2000 Jan;74(1):34-41. Proapelin is processed extracellularly in a cell line-dependent manner with clear modulation by proprotein convertases. Apelin is a peptide hormone that binds to a class A GPCR (the apelin receptor/APJ) to regulate various bodily systems. Upon signal peptide removal, the resulting 55-residue isoform, proapelin/apelin-55, can be further processed to 36-, 17-, or 13-residue isoforms with length-dependent pharmacological properties. Processing was initially proposed to occur intracellularly. However, detection of apelin-55 in extracellular fluids indicates that extracellular processing may also occur. To test for this, apelin-55 was applied exogenously to HEK293A cells overexpressing proprotein convertase subtilisin kexin 3 (PCSK3), the only apelin processing enzyme identified thus far, and to differentiated 3T3-L1 adipocytes, which endogenously express apelin, PCSK3 and other proprotein convertases. Analysis of culture media constituents from each cell type by high performance liquid chromatography-mass spectrometry and western blot demonstrated a time-dependent decrease in apelin-55 levels. This decrease was partially, but not fully, attenuated by PCSK inhibitor treatment in both cell lines. 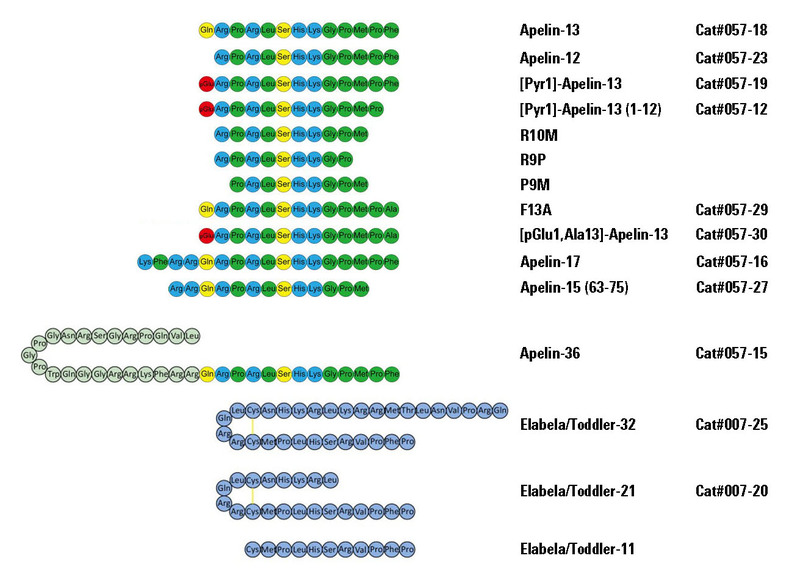 Comparison of the resulting apelin-55-derived peptide profile between the two cell lines demonstrated distinct processing patterns, with apelin-36 production apparent in 3T3-L1 adipocytes vs. detection of the prodomain of a shorter isoform (likely the apelin-13 prodomain, observed after additional proteolytic processing) in PCSK3-transfected HEK293A cells. Extracellular processing of apelin, with distinct cell type dependence, provides an alternative mechanism to regulate isoform-mediated physiological effects of apelin. Bicelle composition-dependent modulation of phospholipid dynamics by apelin peptides. Apelin peptides are cognate ligands for the apelin receptor, a G-protein-coupled receptor (GPCR). The apelinergic system plays critical roles in wide-ranging physiological activities including function and development of the central nervous and cardiovascular systems. Apelin is found in 13-55 residue isoforms in vivo, all of which share the C-terminal portion of the preproapelin precursor. Characterization of high-resolution structures and detergent micelle interactions of apelin-17 led to a two-step membrane-catalyzed binding and GPCR activation mechanism hypothesis recapitulated in longer isoforms. Here, we examine interactions of the apelin-13 and -17 isoforms with isotropic zwitterionic and mixed zwitterionic-anionic lipid bicelles to test for hallmarks of membrane catalysis in a more physiological membrane-mimetic environment than a micelle. Specifically, 1H and 31P relaxation and diffusion solution-state NMR techniques demonstrate that both apelin isoforms interact with both types of isotropic bicelles. Bicelle hydrodynamics were observed to be differentially modulated by apelin peptides, although these effects were minimal. Phospholipid headgroup 31P spin relaxation behaviour was, conversely, clearly perturbed. Perturbation of this nature was also observed in magnetically aligned bicelles by 31P solid-state NMR spectroscopy and spin relaxation experiments. This behaviour is consistent with an apelin-bicelle binding process allowing significant peptide mobility, facilitating membrane-catalyzed GPCR encounter. Ceraudo E, Galanth C, Carpentier E, et al. Biased signaling favoring gi over β-arrestin promoted by an apelin fragment lacking the C-terminal phenylalanine. J Biol Chem. 2014;289(35):24599-610. Localization of apelin and its receptor APJ in limbic structures such as the hippocampus suggests potential involvement of apelin/APJ signaling in stress-related emotional responses. We have recently reported that apelin-13 exerts antidepressant-like actions in acute stressed rats, and that the hippocampus is a critical brain region mediating its actions. However, the neural mechanism underling antidepressant-like actions of apelin-13 is still largely unknown. The aim of the present study is to determine whether apelin-13 ameliorates chronic water-immersion restraint stress (CWIRS)-induced depression-like phenotypes and its neural mechanism in rats. Here, we report that CWIRS exposure leaded to upregulation of apelin/APJ signaling in the hippocampus. Apelin-13 ameliorated CWIRS-induced depression-like phenotypes including hedonic-like deficit and behavioral despairs. Moreover, apelin-13 ameliorated hypothalamic-pituitary-adrenal (HPA) axis hyperactivity, and hippocampal BDNF expression deficit and glucocorticoid receptor (GR) nucleus translocation hypoactivity in chronic stressed rats. Finally, apelin-13-mediated effects were blocked by the selective TrkB receptor antagonist ANA-12. These results suggest that apelin-13 upregulates BDNF against chronic stress-induced depression-like phenotypes by ameliorating HPA axis and hippocampal GR dysfunctions. Dai TT, Wang B, Xiao ZY, You Y, Tian SW. Apelin-13 Upregulates BDNF Against Chronic Stress-induced Depression-like Phenotypes by Ameliorating HPA Axis and Hippocampal Glucocorticoid Receptor Dysfunctions. Neuroscience. 2018;390:151-159. Long-term treatment with acylated analogues of apelin-13 amide ameliorates diabetes and improves lipid profile of high-fat fed mice. Previous studies have shown that modified apelin analogues exhibited enzyme resistance in plasma and improved circulating half-life compared to apelin-13. This study investigated the antidiabetic effects of chronic administration of stable long acting fatty acid modified apelin analogues, namely, (Lys8GluPAL)apelin-13 amide and pGlu(Lys8GluPAL)apelin-13 amide, in high-fat fed obese-diabetic mice. Male NIH Swiss mice (groups n = 8) were maintained either on a high-fat diet (45% fat) from 8 to 28 weeks old, or control mice were fed a normal diet (10% fat). When diet induced obesity-diabetes was established after high-fat feeding, mice were injected i.p. once daily with apelin analogues, liraglutide (25 nmol/kg) or saline (controls). Administration of (Lys8GluPAL)apelin-13 amide and pGlu(Lys8GluPAL)apelin-13 amide for 28 days significantly reduced food intake and decreased body weight. Non-fasting glucose was reduced (p<0.01 to p<0.001) and plasma insulin concentrations increased (p<0.01 to p<0.001). This was accompanied by enhanced insulin responses (p<0.01 to p<0.001) and significant reductions in glucose excursion after oral (p<0.01) or i.p. (p<0.01) glucose challenges and feeding. Apelin analogues also significantly improved HbA1c (p<0.01), enhanced insulin sensitivity (p<0.01), reduced triglycerides (p<0.001), increased HDL-cholesterol (p<0.01) and decreased LDL-cholesterol (p<0.01), compared to high-fat fed saline treated control mice. Cholesterol levels were decreased (p<0.01) by pGlu(Lys8GluPAL)apelin-13 amide and both apelin treated groups showed improved bone mineral content, reduced fat deposits and increased plasma GLP-1. Daily treatment with liraglutide mirrored many of these changes (not on bone or adipose tissue), but unlike apelin analogues increased plasma amylase. Consumption of O2, production of CO2, respiratory exchange ratio and energy expenditure were improved by apelin analogues. These results indicate that long-term treatment with acylated analogues (Lys8GluPAL)apelin-13 amide and particularly pGlu(Lys8GluPAL)apelin-13 amide resulted in similar or enhanced therapeutic responses to liraglutide in high-fat fed mice. Fatty acid derived apelin analogues represent a new and exciting development in the treatment of obesity-diabetes. O'harte FPM, Parthsarathy V, Hogg C, Flatt PR. Long-term treatment with acylated analogues of apelin-13 amide ameliorates diabetes and improves lipid profile of high-fat fed mice. PLoS ONE. 2018;13(8):e0202350. Alzheimer's disease (AD) is a progressive neurodegenerative disease with high outbreak rates. It is estimated that about 35 million individuals around the world suffered from dementia in 2010. AD is expected to increase twofold every 20?years and, by 2030, approximately 65 million people could suffer from this illness. AD is determined clinically by a cognitive impairment and pathologically by the production of amyloid beta (Aβ), neurofibrillary tangles, toxic free radicals and inflammatory mediators in the brain. There is still no treatment to cure or even alter the progressive course of this disease; however, many new therapies are being investigated and are at various stages of clinical trials. Neuropeptides are signaling molecules used by neurons to communicate with each other. One of the important neuropeptides is apelin, which can be isolated from bovine stomach. Apelin and its receptor APJ have been shown to broadly disseminate in the neurons and oligodendrocytes of the central nervous system. Apelin-13 is known to be the predominant neuropeptide in neuroprotection. It is involved in the processes of memory and learning as well as the prevention of neuronal damage. Studies have shown that apelin can directly or indirectly prevent the production of Aβ and reduce its amounts by increasing its degradation. Phosphorylation and accumulation of tau protein may also be inhibited by apelin. Apelin is considered as an anti-inflammatory agent by preventing the production of inflammatory mediators such as interleukin-1β and tumor necrosis factor alpha. It has been shown that in vivo and in vitro anti-apoptotic effects of apelin have prevented the death of neurons. In this review, we describe the various functions of apelin associated with AD and present an integrated overview of recent findings that, in general, recommend apelin as a promising therapeutic agent in the treatment of this ailment. Masoumi J, Abbasloui M, Parvan R, et al. Apelin, a promising target for Alzheimer disease prevention and treatment. Neuropeptides. 2018;70:76-86. The hypotensive effect of activated apelin receptor is correlated with beta-arrestin recruitment. 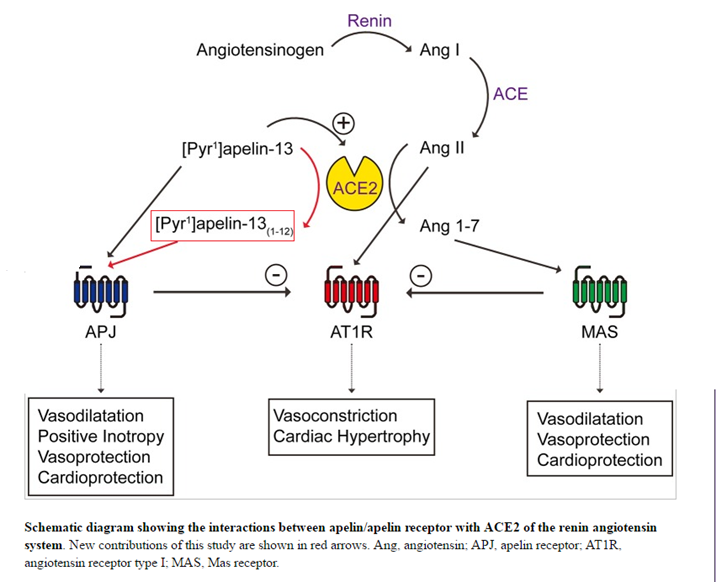 The apelinergic system is an important player in the regulation of both vascular tone and cardiovascular function, making this physiological system an attractive target for drug development for hypertension, heart failure and ischemic heart disease. Indeed, apelin exerts a positive inotropic effect in humans whilst reducing peripheral vascular resistance. In this study, we investigated the signaling pathways through which apelin exerts its hypotensive action. We synthesized a series of apelin-13 analogs whereby the C-terminal Phe13 residue was replaced by natural or unnatural amino acids. In HEK293 cells expressing APJ, we evaluated the relative efficacy of these compounds to activate Gαi1and GαoA G-proteins, recruit β-arrestins 1 and 2 (βarrs), and inhibit cAMP production. Calculating the transduction ratio for each pathway allowed us to identify several analogs with distinct signaling profiles. Furthermore, we found that these analogs delivered i.v. to Sprague-Dawley rats exerted a wide range of hypotensive responses. Indeed, two compounds lost their ability to lower blood pressure, while other analogs significantly reduced blood pressure as apelin-13. Interestingly, analogs that did not lower blood pressure were less effective at recruiting βarrs. Finally, using Spearman correlations, we established that the hypotensive response was significantly correlated with βarr recruitment but not with G protein-dependent signaling. In conclusion, our results demonstrated that the βarr recruitment potency is involved in the hypotensive efficacy of activated APJ. Besserer-offroy É, Bérubé P, Côté J, et al. The hypotensive effect of activated apelin receptor is correlated with β-arrestin recruitment. Pharmacol Res. 2018;131:7-16. Sarcopenia, the degenerative loss of skeletal muscle mass, quality and strength, lacks early diagnostic tools and new therapeutic strategies to prevent the frailty-to-disability transition often responsible for the medical institutionalization of elderly individuals. Herein we report that production of the endogenous peptide apelin, induced by muscle contraction, is reduced in an age-dependent manner in humans and rodents and is positively associated with the beneficial effects of exercise in older persons. Mice deficient in either apelin or its receptor (APLNR) presented dramatic alterations in muscle function with increasing age. Various strategies that restored apelin signaling during aging further demonstrated that this peptide considerably enhanced muscle function by triggering mitochondriogenesis, autophagy and anti-inflammatory pathways in myofibers as well as enhancing the regenerative capacity by targeting muscle stem cells. Taken together, these findings revealed positive regulatory feedback between physical activity, apelin and muscle function and identified apelin both as a tool for diagnosis of early sarcopenia and as the target of an innovative pharmacological strategy to prevent age-associated muscle weakness and restore physical autonomy. This publication used the apelin EIA Kit (EK-057-15) from Phoenix Pharmaceuticals. Apelin conformational and binding equilibria upon micelle interaction primarily depend on membrane-mimetic headgroup. Apelin is one of two peptide hormones that activate the apelin receptor (AR or APJ) to regulate the cardiovascular system, central nervous system, and adipoinsular axis. Here, we apply circular dichroism (CD) spectropolarimetry and nuclear magnetic resonance (NMR) spectroscopy to characterize the potential membrane binding by the two longest bioactive apelin isoforms, apelin-55 and -36, using membrane-mimetic dodecylphosphocholine (DPC), sodium dodecyl sulfate (SDS), and 1-palmitoyl-2-hydroxy-sn-glycero-3-[phospho-rac-(1-glycerol)] (LPPG) micelles. Pulsed field gradient diffusion NMR experiments demonstrated preferential interaction of both apelin-55 and -36 with anionic SDS and LPPG micelles over zwitterionic DPC micelles. Chemical shift perturbations and changes in ps-ns scale dynamics of apelin-55 in all micelles were similarly localized along the polypeptide backbone, demonstrating clear dependence upon detergent headgroup, while comparison of chemical shifts between apelin-55 and apelin-36 showed negligible differences indicative of highly similar modes of micelle interaction. Notably, the observed behaviour was consistent with an ensemble averaged pair of free and bound states in fast exchange on the NMR timescale proportional to the fraction of micelle-bound protein, implying a similar conformational equilibrium regardless of headgroup and tailgroup. Membrane catalysis of apelin-AR binding would thus give rise to analogous behaviour in the essential C-terminal region common to all apelin isoforms. Shin K, Sarker M, Huang SK, Rainey JK. Apelin conformational and binding equilibria upon micelle interaction primarily depend on membrane-mimetic headgroup. Sci Rep. 2017;7(1):15433. Bioactivity of the putative apelin proprotein expands the repertoire of apelin receptor ligands. BACKGROUND: Apelin is a peptide ligand for a class A G-protein coupled receptor called the apelin receptor (AR or APJ) that regulates angiogenesis, the adipoinsular axis, and cardiovascular functions. Apelin has been shown to be bioactive as 13, 17, and 36 amino acid isoforms, C-terminal fragments of the putatively inactive 55-residue proprotein (proapelin or apelin-55). Although intracellular proprotein processing has been proposed, isolation of apelin-55 from colostrum and milk demonstrates potential for secretion prior to processing and the possibility of proapelin-AR interaction. METHODS: Apelin isoform activity and potency were compared by an In-Cell Western™ assay for ERK phosphorylation using a stably AR-transfected HEK293A cell line. Conformational comparison of apelin isoforms was carried out by circular dichroism and heteronuclear solution-state nuclear magnetic resonance spectroscopy. RESULTS: Apelin-55 is shown to activate the AR, with similar maximum ERK phophorylation response and potency to the shorter isoforms except for apelin-13, which exhibited a greater potency. Correlating to this shared activity, highly similar conformations are exhibited in all apelin isoforms for the shared C-terminal region responsible for receptor binding and activation. CONCLUSIONS: AR activation by all apelin isoforms likely hinges upon shared conformation and dynamics in the C-terminus, with apelin-55providing an alternative bioactive isoform despite the addition of 19N-terminal residues relative to apelin-36. GENERAL SIGNIFICANCE: Beyond providing novel insight into the physiology of this system, re-annotation of proapelin to the bioactive apelin-55 isoform adds to the molecular toolkit for dissection of apelin-AR interactions and expands the repertoire of therapeutic targets for the apelinergic system. Shin K, Chapman NA, Sarker M, et al. Bioactivity of the putative apelin proprotein expands the repertoire of apelin receptor ligands. Biochim Biophys Acta Gen Subj. 2017;1861(8):1901-1912. BACKGROUND: Elabela/toddler (ELA) is a critical cardiac developmental peptide that acts through the G-protein-coupled apelinreceptor, despite lack of sequence similarity to the established ligand apelin. Our aim was to investigate the receptor pharmacology, expression pattern, and in vivo function of ELA peptides in the adult cardiovascular system, to seek evidence for alteration in pulmonary arterial hypertension (PAH) in which apelin signaling is downregulated, and to demonstrate attenuation of PAH severity with exogenous administration of ELA in a rat model. METHODS: In silico docking analysis, competition binding experiments, and downstream assays were used to characterize ELA receptor binding in human heart and signaling in cells expressing the apelin receptor. ELA expression in human cardiovascular tissues and plasma was determined using real-time quantitative polymerase chain reaction, dual-labeling immunofluorescent staining, and immunoassays. Acute cardiac effects of ELA-32 and [Pyr1]apelin-13 were assessed by MRI and cardiac catheterization in anesthetized rats. Cardiopulmonary human and rat tissues from PAH patients and monocrotaline- and Sugen/hypoxia-exposed rats were used to show changes in ELA expression in PAH. The effect of ELA treatment on cardiopulmonary remodeling in PAH was investigated in the monocrotaline rat model. RESULTS: ELA competed for binding of apelin in human heart with overlap for the 2 peptides indicated by in silico modeling. ELA activated G-protein- and β-arrestin-dependent pathways. We detected ELA expression in human vascular endothelium and plasma. Comparable to apelin, ELA increased cardiac contractility, ejection fraction, and cardiac output and elicited vasodilatation in rat in vivo. ELA expression was reduced in cardiopulmonary tissues from PAH patients and PAH rat models, respectively. ELA treatment significantly attenuated elevation of right ventricular systolic pressure and right ventricular hypertrophy and pulmonary vascular remodeling in monocrotaline-exposed rats. CONCLUSIONS: These results show that ELA is an endogenous agonist of the human apelin receptor, exhibits a cardiovascular profile comparable to apelin, and is downregulated in human disease and rodent PAH models, and exogenous peptide can reduce the severity of cardiopulmonary remodeling and function in PAH in rats. This study provides additional proof of principle that an apelinreceptor agonist may be of therapeutic use in PAH in humans. This publication used Apelin-13 antibody, peptide from Phoenix Pharmaceuticals. Yang P, Read C, Kuc RE, et al. ,Circulation. 2017;135(12):1160-1173. Effects of time of day and the wingate test on appetite perceptions, food intake and plasma levels of adipokines. It has been demonstrated that several aspects of adipose-related physiology including adipokine release, exhibit daily oscillations. Physical exercise exerts a strong influence on adipokine release and a possible reverse disruption of peripheral circadian clocks. The aim of this study was to establish the effects of time of day and the Wingate test on appetite perception, food intake and plasma levels of adipokines. Twenty-four moderately active non-smoking males (mean ± S.D. age: 27.1 ± 3.1 years; height: 1.79 ± 0.1 m; weight: 76.1 ± 11.7 kg) were recruited for this study and divided in two groups; one fed with an ad libitum test meal and another one without an ad libitum test meal. Each subject participated in the following studies performed at 11:00 and 23:00 hours on separate days: 1) Exercise study (ES): a 30-second Wingate Anaerobic Test (WAnT), and 2) sedentary study (SS). Subjects rated their appetite perceptions (hunger and prospective food consumption) on a 100-milimeter visual analogue scale (VAS) at baseline, after exercise, after test meal and during the postprandial/control period. At those time points blood samples were obtained for the measurement of plasma leptin, visfatin and apelin concentrations. Appetite perception and energy intake results at test meal decreased in response to WAnT in comparison with sedentary subjects. Time of day had no statistically significant effect on energy intake but the appetite perception score after test meal at 24:00 hours was statistically higher than that after test meal at 12:00 hours. No significant differences in the tested plasma adipokine concentrations between the trials existed at baseline, however, all plasma adipokine levels at 24:00 hours were higher than those at 12:00 hours. Plasma apelin concentrations after WAnT were significantly higher than its pre-exercise value at 12:00 hours, unlike those at 24:00 hours. Sedentary experiments showed a modest, yet significant, rise in plasma apelin levels after the test meal at 12:00 hours but not after the one at 24:00 hours. There were no significant changes in plasma leptin concentrations after exercise or test meal but a significant decrease in plasma visfatin concentrations after exercise intervention both at the 12:00 hours test and the 24:00 hours test has been observed. Test meals caused a significant rise in visfatin concentrations in sedentary, but not exercise series, in the daytime and nighttime tests. We conclude that time of day is an important aspect to consider in the relationships between exercise, metabolism and appetite. Further studies are needed to explain the specific mechanisms underlying the effects of acute exercise on postprandial physiology at different times of the day. This publication used an Apelin EIA Kit (#EK-057-23) from Phoenix Pharmaceuticals. Bilski J, Jaworek J, Pokorski J, et al. J Physiol Pharmacol. 2016;67(5):667-676. Neuroprotective effects of apelin-13 on experimental ischemic stroke through suppression of inflammation. Acute inflammation plays an important role in the pathogenic progression of post-ischemic neuronal damage. Apelin-13 has been investigated as a neuropeptide for various neurological disorders. The present study was performed to evaluate the effects of apelin-13 on the inflammation of cerebral ischemia/reperfusion (I/R) injury. Transient focal I/R model in male Wistar rats were induced by 2h middle cerebral artery occlusion (MCAO) followed by 24h reperfusion. Rats then received treatment with apelin-13 or vehicle after ischemia at the onset of reperfusion. The neurological deficit was evaluated and the infarct volume was measured by TTC staining. The activity of myeloperoxidase (MPO) was measured. The expression of pro-inflammatory cytokines including tumor necrosis factor-α (TNF-α), interleukin-1β (IL-1β), and intercellular adhesion molecule-1 (ICAM-1) were measured using real-time PCR. 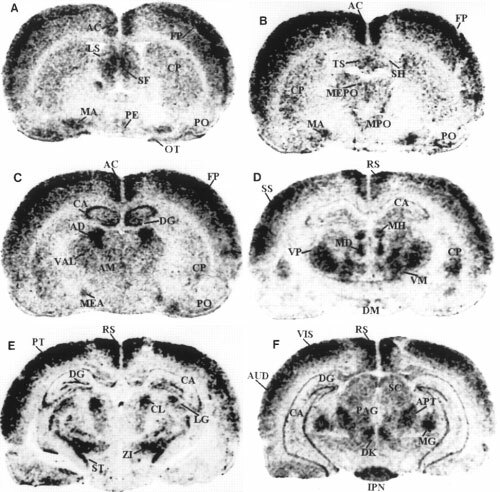 And the expression of apelin receptor (APJ), ionized calcium-binding adapter molecule-1 (Iba1), glial fibrillary acidic protein (GFAP) and high mobility group box 1 (HMGB1) were measured by immunohistochemistry and western blot. Our results demonstrated that treatment with apelin-13 in I/R rats markedly reduced neurological deficits and the infarct volume. The increase of MPO activity induced by I/R was inhibited by apelin-13 treatment. The real-time PCR showed that apelin-13 decreased the expression of inflammatory cytokines such as IL-1β, TNF-α and ICAM-1 in I/R rats. The expression of APJ in I/R rats was increased. And the expression of Iba1, GFAP and HMGB1 in I/R rats was decreased by apelin-13 treatment indicating the inhibition of microglia, astrocytes and other inflammatory cells. In conclusion, apelin-13 is neuroprotective for neurons against I/R through inhibiting the neuroinflammation. This publication used Apelin peptides (#057-19) from Phoenix Pharmaceuticals. Xin Q, Cheng B, Pan Y, et al. Neuroprotective effects of apelin-13 on experimental ischemic stroke through suppression of inflammation. Peptides. 2015;63:55-62. Biased signaling favoring gi over β-arrestin promoted by an apelin fragment lacking the C-terminal phenylalanine. Apelin plays a prominent role in body fluid and cardiovascular homeostasis. We previously showed that the C-terminal Phe of apelin 17(K17F) is crucial for triggering apelin receptor internalization and decreasing blood pressure (BP) but is not required for apelin binding or Gi protein coupling. Based on these findings, we hypothesized that the important role of the C-terminal Phe in BP decrease may be as a Gi-independent but β-arrestin-dependent signaling pathway that could involve MAPKs. For this purpose, we have used apelin fragments K17F and K16P (K17F with the C-terminal Phe deleted), which exhibit opposite profiles on apelin receptor internalization and BP. Using BRET-based biosensors, we showed that whereas K17F activates Gi and promotes β-arrestin recruitment to the receptor, K16P had a much reduced ability to promote β-arrestin recruitment while maintaining its Gi activating property, revealing the biased agonist character of K16P. We further show that both β-arrestin recruitment and apelin receptor internalization contribute to the K17F-stimulated ERK1/2 activity, whereas the K16P-promoted ERK1/2 activity is entirely Gi-dependent. In addition to providing new insights on the structural basis underlying the functional selectivity of apelin peptides, our study indicates that the β-arrestin-dependent ERK1/2 activation and not the Gi-dependent signaling may participate in K17F-induced BP decrease. Maintenance of human energy homeostasis is regulated by a complex network. Peptides secreted from the gastrointestinal tract (GI) are signaling to the brain and other organs initiating or terminating food intake and energy expenditure. In the present study we investigated basal plasma levels of apelin, orexin-A, and leptin in morbid obese patients. In addition, we measured in a subgroup of these patients in the same individual orexin-A and leptin plasma levels one year after gastric banding surgery. METHODS: Basal plasma values were determined in obese patients (BMI=48+/-1 kg/m2n=32) after an overnight fast and compared to healthy, normal weighted (BMI=22+/-2 kg/m2n=12) controls. In addition, blood samples were collected in a subgroup of patients (BMI=48+/-1 kg/m2n=8) the day before surgery and 1 year after the operation. Apelin, orexin-A, and leptin levels were analysed using ELISAs. RESULTS: One year after the operation obese patients significantly lost weight (from 48+/-2 kg/m2 to 39+/-2 kg/m2; p<0,001). Apelin, orexin-A and leptin levels in obese patients were significantly higher compared to control individuals (736+/-50 pg/ml vs. 174+/-14 pg/ml, p<0.0001; 75.3+/-24.1 pg/ml vs. 0.8+/-0.4 pg/ml, p<0.0001; 79.0+/-2.4 ng/ml vs. 5.8+/-0.8 ng/ml, p<0.0001, respectively). Apelin and leptin plasma concentrations also correlated significantly with BMI (r=0.769, p<0.0001; r=0.778; p<0.0001, respectively), while orexin-A correlation was rather weak (r=0.335, p<0.03). No difference between pre- and post-operative orexin-A levels was observed, while leptin plasma levels significantly decreased from 45.1+/-5.4 ng/ml to 27.3+/-6.0 ng/ml (p=0.015). CONCLUSIONS: Apelin, orexin-A, and leptin plasma levels correlated positively with the BMI. One year after gastric banding with significant loss in BMI basal plasma levels of leptin decreased, while orexin-A remained unchanged. 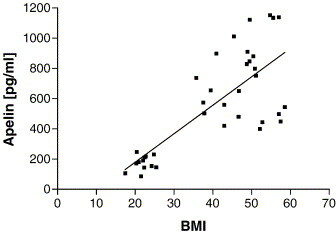 Plasma apelin levels correlated significantly with BMI (r = 0.769; p = 0.0001). Mean value in obese patients (n = 25; 736 ± 50 pg/ml) was significantly higher compared to controls (n = 12; 174 ± 14 pg/ml, p < 0.0001). Heinonen MV, et al. Regul Pept. 2005 Aug 15;130(1-2):7-13. The results presented herein demonstrate that apelin is expressed and secreted by both human and mouse adipocytes. Apelin mRNA levels in isolated adipocytes are close to other cell types present in white adipose tissue or other organs known to express apelin such as kidney, heart, and to a lesser extent brown adipose tissue. Apelin expression is increased during adipocyte differentiation stage. A comparison of four different models of obesity in mice showed a large increase in both apelin expression in fat cells and apelin plasma levels in all the hyperinsulinemia-associated obesities and clearly demonstrated that obesity or high fat feeding are not the main determinants of the rise of apelin expression. The lack of insulin in streptozotocin-treated mice is associated with a decreased expression of apelin in adipocytes. Furthermore, apelin expression in fat cells is strongly inhibited by fasting and recovered after refeeding, in a similar way to insulin. A direct regulation of apelin expression by insulin is observed in both human and mouse adipocytes and clearly associated with the stimulation of PI3K, PKC and MAPK. These data provide evidence that insulin exerts a direct control on apelin gene expression in adipocytes. In obese patients, both plasma apelin and insulin levels were significantly higher suggesting that the regulation of apelin by insulin could influence blood concentrations of apelin. The present work identifies apelin as a novel adipocyte endocrine secretion and focuses on its potential link with obesity-associated variations. Boucher et al. Endocrinology. 2005 Apr;146(4):1764-71. The apelin peptide is the endogenous ligand for the apelin G protein-coupled receptor. The distribution of the apelin peptides and receptor are widespread in the central nervous system and periphery, with reported roles in the hypothalamic-pituitary-adrenal axis, blood pressure regulation and as one of the most potent positive inotropic substances yet identified. In this report, we show that in native tissues preproapelin exists as a dimer. Dimeric preproapelin was reduced to monomers by dithiothreitol treatment, indicating disulfide linkages. To evaluate the role of the carboxyl-terminal phenylalanine in the hypotensive action of apelin-13, analogs were generated and tested for their role on blood pressure regulation. Injections of apelin-13 and apelin-12 (15 microg/kg) into spontaneously hypertensive rats lowered systolic and diastolic blood pressure to result in decreases of approximately 60% and 15% in mean arterial blood pressure, respectively. Apelin-13(13[D-Phe]) treatment did not differ from apelin-13 in either efficacy or duration of effect, whereas apelin-13(F13A) revealed a loss of function. However, concomitant administration of apelin-13(F13A) (30 microg/kg) blocked hypotensive effects of apelin-13 (15 microg/kg), which revealed that apelin-13(F13A) behaved as an apelin-specific antagonist. Lee et al. Endocrinology. 2005 Jan;146(1):231-6. Apelin, a new enteric peptide: localization in the gastrointestinal tract, ontogeny, and stimulation of gastric cell proliferation and of cholecystokinin secretion. Apelin is a recently discovered peptide that is the endogenous ligand for the APJ receptor. The aim of this study was to characterize apelin expression (mRNA levels) in the rat gastrointestinal (GI) tract and pancreas, to localize distribution of apelin peptide containing cells in the stomach by immunohistochemistry (IHC), to characterize the ontogeny of gastric apelin expression and peptide, and the influence of apelin on gastric cell proliferation in vitro. Additionally, the effect of apelin on cholecystokinin (CCK) secretion, and the involvement of mitogen-activated protein kinase (MAPK), protein kinase C (PKC) and changes in [Ca++]i in apelin-induced CCK secretion in vitro were examined. Northern analysis showed a maximal apelin expression in the stomach with a lower expression level in the intestine. Apelin expression was not detected in the pancreas. IHC revealed abundant apelin positive cells in the glandular epithelium of the stomach. The ontogeny study showed a higher apelin expression in the fetal and postnatal rat stomachs when compared to the adult stomach. In contrast to apelin expression, apelin peptide was not detected in the rat stomach until 20 days of age and then increased progressively with age. Apelin was shown to stimulate gastric cell proliferation in vitro. Apelin also stimulated CCK secretion from a murine enteroendocrine cell line (STC-1); apelin-stimulated CCK secretion is mediated through MAPK but not by [Ca++]i signaling. Together, these data indicate that apelin is an important new stomach peptide with a potential physiologic role in the GI tract. Wang et al. Endocrinology. 2004 Mar;145(3):1342-8. [(125)I]-(Pyr(1))Apelin-13 is a novel radioligand for localizing the APJ orphan receptor in human and rat tissues with evidence for a vasoconstrictor role in man. 1. We have determined the binding characteristics of [(125)I]-(Pyr(1))Apelin-13, a putative ligand for the APJ orphan receptor in human cardiovascular and rat tissue and investigated the functional properties of (Pyr(1))Apelin-13 in human saphenous vein. 2. The binding of [(125)I]-(Pyr(1))Apelin-13 to sections of human heart tissue was time dependent and rapid at 23 degrees C. Data were fitted to a single site model with an association rate constant (k(obs)) of 0.115 min(-1). [(125)I]-(Pyr(1))Apelin-13 also dissociated from a single site with a dissociation rate constant of 0.0105 min(-1). 3. In saturation binding experiments [(125)I]-(Pyr(1))Apelin-13 bound to human left ventricle with a K(D) value of 0.35+/-0.08 nM, B(max) of 4.3+/-0.9 fmol mg(-1) protein with a Hill slope of 0.97+/-0.04 and to the right atria with a K(D) of 0.33+/-0.09 nM, B(max) of 3.1+/-0.6 fmol mg(-1) protein and a Hill slope of 0.93+/-0.05. 4. [(125)I]-(Pyr(1))Apelin-13 binding sites were localized using autoradiography to human cardiovascular tissue, including coronary artery, aorta and saphenous vein grafts. In rat tissue a high density of receptors were localized to the molecular layer of the rat cerebellum, rat lung, rat heart and low levels in the rat kidney cortex. 5. (Pyr(1))Apelin-13 potently contracted human saphenous vein with a pD(2) value of 8.4+/-0.2 (n=8). The maximum response elicited by the peptide was 22.6+/-6% of 100 mM KCl. 6. We provide the first evidence of APJ receptor expression, relative densities and functional properties of (Pyr(1))Apelin-13 in human cardiovascular tissue. Katugampola et al. Br J Pharmacol. 2001 Mar;132(6):1255-60. The orphan receptor APJ and its recently identified endogenous ligand, apelin, are expressed in the heart. However, their importance in the human cardiovascular system is not known. This study shows that apelin-like immunoreactivity is abundantly present in healthy human heart and plasma. Gel filtration HPLC analysis revealed that atrial and plasma levels of high molecular weight apelin, possibly proapelin, were markedly higher than those of mature apelin-36 itself. As assessed by quantitative RT-PCR analysis, left ventricular apelin mRNA levels were increased 4.7-fold in chronic heart failure (CHF) due to coronary heart disease (p<0.01) and 3.3-fold due to idiopathic dilated cardiomyopathy (p<0.05), whereas atrial apelin mRNA levels were unchanged. Atrial and plasma apelin-like immunoreactivity (using Phoenix's Apelin-36 (Human) RIA Kit) as well as atrial and ventricular APJ receptor mRNA levels were significantly decreased in CHF. Our results suggest that a new cardiac regulatory peptide, apelin, and APJ receptor may contribute to the pathophysiology of human CHF. Atrial and ventricular immunoreactive apelin levels Apelin-like immunoreactivity was detected in the heart of organ donors, being over 200-fold higher in the right atria than in the left ventricles (650 ± 145 pg/mg, n=5 and 2.8 ± 0.6 pg/mg, n=10, respectively). There was a tendency for left ventricular ir-apelin levels to be higher in patients with heart failure due to coronary heart disease (4.4 ± 0.5 pg/mg, p=0.07) and idiopathic dilated cardiomyopathy (3.8 ± 0.9 pg/mg, p=0.4) than those in controls, but these changes were not statistically significant (Fig. 1B). Interestingly, atrial ir-apelin levels were significantly decreased in patients with heart failure (Fig. 2B). Plasma apelin levels in normal subjects and in patients with heart failure Immunoreactive apelin was found to be present in normal human plasma (mean, 89.8 ± 5.3 pg/ml, n=6). Plasma levels of ir-apelin were significantly decreased in patients with heart failure due to coronary heart disease compared to normal subjects (in NYHA III: 71 ± 6 pg/ml, p<0.05). Plasma ir-apelin levels showed significant correlation to atrial ir-apelin levels (R=0.4, n=38, p<0.05). (A), immunoreactive apelin-36 (B), and APJ receptor mRNA (C) levels in control subjects (n=9) and patients with end-stage heart failure due to coronary heart disease (CHD, n=7) and idiopathic dilated cardiomyopathy (IDC, n=6). The mRNA results are expressed as ratios to 18S RNA determined by TaqMan real-time quantitative RT-PCR analysis. Bars indicate means ?nbsp;SEM. *p<0.05 and **p<0.01 vs. control subjects. (A), immunoreactive apelin-36 (B), and APJ receptor mRNA (C) levels in control subjects (n=6) and patients with heart failure (NYHA functional class II or III) due to coronary heart disease (CHD, n=38). Bars indicate means SEM. *p<0.05 and **p<0.01 vs. control subjects. Gel filtration HPLC analysis of immunoreactive apelin in plasma (A,B) and atrial extracts (C,D) of a healthy control (A,C) and a patient with heart failure (B,D). The arrows denote elution positions of bovine serum albumin (V0), apelin-36, and 125I-, used for the calibration of the column. Apelin is an endogenous ligand of the human orphan receptor APJ (orphan G protein-coupled receptor). This peptide is produced through processing from the C-terminal portion in the pre-proprotein consisting of 77 amino acid residues and exists in multiple molecular forms. Although the main physiological functions of apelin have not been clarified yet, it has been demonstrated that apelin partially suppresses cytokine production from mouse spleen and, specifically, induces the promotion of extracellular acidification and inhibition of cAMP production in Chinese hamster ovary cells. Moreover, it is involved in the regulation of blood pressure and blood flow. In this study we have analyzed, by immunohistochemistry, apelin distribution in several human tissues, demonstrating that apelin has a widespread pattern of expression. These results seem to confirm that apelin functions widely in various tissues interacting with its specific receptor APJ. Tissue and blood sampling. After removal, cardiac tissue samples were blotted dry, immersed in liquid nitrogen, and stored at -80 °C until assayed. For plasma sampling, blood was taken before surgery after 30 min bed rest and collected into chilled tubes containing EDTA. The plasma was separated by centrifugation at +4 oC and kept at -80 oC until assayed. Radioimmunoassay for apelin. Immunoreactive apelin (ir-apelin) was determined from extracted plasma and right atrial and left ventricular samples using an apelin-36 radioimmunoassay kit (Phoenix, Cat-No. RK-057-15). Apelin assay was performed according to the manufacturer's instructions. The sensitivity of assay was 1 fmol/tube. Tissue peptide levels are expressed as a concentration per mg wet weight. HPLC analysis. Gel filtration high performance liquid chromatography (GF-HPLC) and apelin radioimmunoassay were used in order to characterize the molecular form of immunoreactive apelin in plasma and tissue extracts. Aliquots of the atrial tissue homogenates, used for RNA extraction, from healthy subjects and patients with heart failure were diluted to 400 ul of 40% acetonitrile in aqueous 0.1% TFA. Plasma samples (1 ml) were extracted with SepPak C18 cartridges, dried, and reconstituted in 400 ul of 40% acetonitrile in aqueous 0.1% TFA. The samples were passed through Millex HV filters (Millipore) before being loaded into the 7.8 ?nbsp;300 mm ProteinPak-125 column (Waters). The column was eluted with 40% acetonitrile in aqueous 0.1% TFA at 1 ml/min. Fractions of 0.5 ml were collected, dried in Savant SpeedVac, and subjected in duplicate to apelin radioimmunoassay. The column was calibrated with bovine serum albumin (void volume), apelin-36, and 125I- (total volume). The orphan receptor APJ and its recently identified endogenous ligand, apelin, exhibit high levels of mRNA expression in the heart. However, the functional importance of apelin in the cardiovascular system is not known. In isolated perfused rat hearts, infusion of apelin (0.01 to 10 nmol/L) induced a dose-dependent positive inotropic effect (EC50: 33.1+/-1.5 pmol/L). Moreover, preload-induced increase in dP/dt(max) was significantly augmented (P<0.05) in the presence of apelin. Inhibition of phospholipase C (PLC) with U-73122 and suppression of protein kinase C (PKC) with stauzrosporine and GF-109203X markedly attenuated the apelin-induced inotropic effect (P<0.001). In addition, zoniporide, a selective inhibitor of Na+-H+ exchange (NHE) isoform-1, and KB-R7943, a potent inhibitor of the reverse mode Na+-Ca2+ exchange (NCX), significantly suppressed the response to apelin (P<0.001). Perforated patch-clamp recordings showed that apelin did not modulate L-type Ca2+ current or voltage-activated K+ currents in isolated adult rat ventricular myocytes. Apelin mRNA was markedly downregulated in cultured neonatal rat ventricular myocytes subjected to mechanical stretch and in vivo in two models of chronic ventricular pressure overload. The present study provides the first evidence for the physiological significance of apelin in the heart. Our results show that apelin is one of the most potent endogenous positive inotropic substances yet identified and that the inotropic response to apelin may involve activation of PLC, PKC, and sarcolemmal NHE and NCX. With the use of an antiserum against human apelin-36 (Phoenix Pharmaceuticals), apelin-immunoreactivity (irAP) was detected in neurons and cell processes of the supraoptic nucleus (SO), paraventricular nucleus (PVH), accessory neurosecretory nuclei (Acc) and suprachiasmatic nucleus. Strongly labeled cells/processes were noted in the internal layer of the median eminence, infundibular stem, anterior and posterior pituitary. Double-labeling the sections with goat polyclonal neurophysin I-antiserum and rabbit polyclonal apelin-antiserum revealed a population of magnocellular neurons in the PVH, SO and Acc expressing both irAP and neurophysin I-immunoreactivity (irNP), the latter being a marker of oxytocin-containing neurons. By inference, the AP-positive but irNP-negative magnocellular neurons could be vasopressin-containing. The presence of irAP in certain hypothalamic nuclei and pituitary suggests that the peptide may be a signaling molecule released from the hypothalamic-hypophysial axis. Apelin is the recently identified endogenous ligand for the G-protein-coupled receptor, APJ. Preproapelin and APJ mRNA are found in hypothalamic regions known to be important in the regulation of food and water intake, and pituitary hormone release. The effects of intracerebroventricular (ICV) administration of pyroglutamylated apelin-13 on food and water intake and pituitary hormone release in rats were investigated. Apelin-13 had little effect on food intake, but dose-dependently increased drinking behaviour and water intake at 1 h. Apelin-13 (10 nmol) increased water intake by up to sixfold compared to saline. Compared to saline control, apelin-13 (10 nmol) significantly increased plasma ACTH and corticosterone and decreased plasma prolactin, LH and FSH at 30 min. In vitro, apelin-13 stimulated the release of CRH and AVP from hypothalamic explants, but had no effect on NPY release. These results suggest that apelin may play an important role in the hypothalamic regulation of water intake and endocrine axes. Apelin is an endogenous ligand of the human orphan receptor APJ. We detected apelin-like immunoreactivity in the adipocytes, gastric mucosa, and Kupffer cells in the liver. We also detected apelin-like immunoreactivity localized within the endothelia of small arteries in various organs. Further, it was found that mean arterial pressure after the administration of apelin-12, apelin-13, and apelin-36 at a dose of 10 nmol/kg in anaesthetized rats was reduced by 26+/-5, 11+/-4, and 5+/-4 mm Hg, respectively. In the presence of a nitric oxide (NO) synthase inhibitor, the effect of apelin-12 on blood pressure was abolished. Furthermore, the administration of apelin-12 (10 nmol/kg) in rats produced a transitory elevation of the plasma nitrite/nitrate concentration from a basal level of 21.4+/-1.6 to 27.0+/-1.5 microM. Thus, apelin may lower blood pressure via a nitric oxide-dependent mechanism. The apelin peptide was recently discovered and demonstrated to be the endogenous ligand for the G protein-coupled receptor, APJ. A search of the GenBank databases retrieved a rat expressed sequence tag partially encoding the preproapelin sequence. The GenBank search also revealed a human sequence on chromosome Xq25-26.1, containing the gene encoding preproapelin. We have used the rat sequence to screen a rat brain cDNA library to obtain a cDNA encoding the full-length open reading frame of rat preproapelin. This cDNA encoded a protein of 77 amino acids, sharing an identity of 82% with human preproapelin. 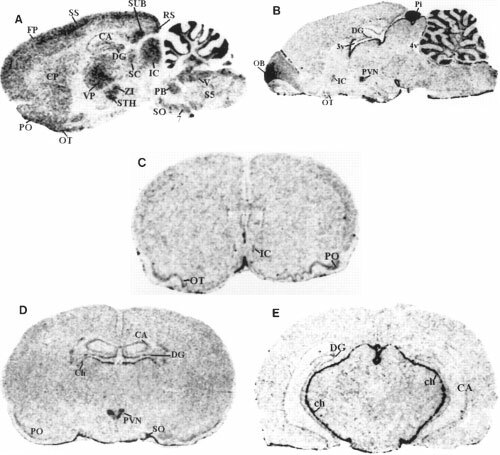 Northern and in situ hybridization analyses revealed both human and rat apelin and APJ to be expressed in the brain and periphery. Both sequence and mRNA expression distribution analyses revealed similarities between apelin and angiotensin II, suggesting they that share related physiological roles. A synthetic apelin peptide was injected intravenously into male Wistar rats, resulting in immediate lowering of both systolic and diastolic blood pressure, which persisted for several minutes. Intraperitoneal apelin injections induced an increase in drinking behavior within the first 30 min after injection, with a return to baseline within 1 h.
Search for an endogenous ligand of the orphan G protein-coupled receptor--discovery of apelin, a novel biologically active peptide. In the search for an endogenous ligand of the human orphan receptor APJ, we have isolated from bovine stomach extracts a novel 36-amino acid peptide, designated apelin. The APJ receptor is one of the G protein-coupled orphan receptors, many of which have been considered to be specific receptors for unidentified hormones and neuropeptides. We recently found the presence of apelin in the adipocytes and vascular walls as well as in the stomach. We examined biological activities of apelin and found that apelin lowered blood pressure in rats and also released cholecystokinin(CCK) from dispersed intestinal endocrine cells. Since apelin is an endogenous ligand for the HIV entry coreceptor APJ, we tested the effect of apelin on the entry of HIV in association with CD4, and found that apelin blocked the entry of HIV-1 and HIV-2. Takemoto et al. Nippon Rinsho. 2000 Mar;58(3):737-46. Molecular and functional characteristics of APJ. Tissue distribution of mRNA and interaction with the endogenous ligand apelin. Hosoya et al. J Biol Chem. 2000 Jul 14;275(28):21061-7. Apelin peptides block the entry of human immunodeficiency virus (HIV). The orphan G protein-coupled receptor APJ has been shown to be a coreceptor for human and simian immunodeficiency virus (HIV and SIV) strains. We have determined that some HIV and SIV strains use APJ as a coreceptor to infect the brain-derived NP-2/CD4 cells. Because apelin is an endogenous ligand for the APJ receptor, we examined the inhibitory effects of apelin peptides on HIV infection, and found that the apelin peptides inhibit the entry of some HIV-1 and HIV-2 into the NP-2/CD4 cells expressing APJ. The inhibitory efficiency has been found to be in the order of apelin-36>apelin-17>apelin-13>apelin-12. Zou et al. FEBS Lett 2000 May 4;473(1):15-8. By using a strategy that we have developed to search for the ligands of orphan seven-transmembrane-domain receptors [S. Hinuma et al., Nature 393 (1998) 272-276], we have recently identified a natural ligand, apelin, for the orphan 7TMR, APJ [K. Tatemoto et al., Biochem. Biophys. Res. Commun. 251 (1998) 471-476]. In this paper, we isolated rat and mouse apelin cDNAs, and analyzed the tissue distribution of apelin mRNA in rats. Although apelin mRNA was widely detected in a variety of tissues, the highest expression of apelin mRNA was detected in the mammary gland of pregnant rats. In the mammary gland, biologically active apelin and its mRNA considerably increased during pregnancy and lactation, and reached a maximal level around parturition. Moreover, a large amount of apelin (14-93 pmol/ml) was found to be secreted in the bovine colostrum, and it was still detectable even in commercial bovine milk. Since apelin partially suppressed cytokine production by mouse spleen cells in response to T cell receptor/CD3 cross-linking, the oral intake of apelin in the colostrum and milk might modulate immune responses in neonates. Habata et al. Biochim Biophys Acta. 1999 Oct 13;1452(1):25-35. 1. We have determined the binding characteristics of [(125)I]-(Pyr(1))Apelin-13, a putative ligand for the APJ orphan receptor in human cardiovascular and rat tissue and investigated the functional properties of (Pyr(1))Apelin-13 in human saphenous vein. 2. The binding of [(125)I]-(Pyr(1))Apelin-13 to sections of human heart tissue was time dependent and rapid at 23 degrees C. Data were fitted to a single site model with an association rate constant (k(obs)) of 0.115 min(-1). [(125)I]-(Pyr(1))Apelin-13 also dissociated from a single site with a dissociation rate constant of 0.0105 min(-1). 3. In saturation binding experiments [(125)I]-(Pyr(1))Apelin-13 bound to human left ventricle with a K(D) value of 0.35+/-0.08 nM, B(max) of 4.3+/-0.9 fmol mg(-1) protein with a Hill slope of 0.97+/-0.04 and to the right atria with a K(D) of 0.33+/-0.09 nM, B(max) of 3.1+/-0.6 fmol mg(-1) protein and a Hill slope of 0.93+/-0.05. 4. [(125)I]-(Pyr(1))Apelin-13 binding sites were localized using autoradiography to human cardiovascular tissue, including coronary artery, aorta and saphenous vein grafts. In rat tissue a high density of receptors were localized to the molecular layer of the rat cerebellum, rat lung, rat heart and low levels in the rat kidney cortex. 2. (Pyr(1))Apelin-13 potently contracted human saphenous vein with a pD(2) value of 8.4+/-0.2 (n=8). The maximum response elicited by the peptide was 22.6+/-6% of 100 mM KCl. 6. We provide the first evidence of APJ receptor expression, relative densities and functional properties of (Pyr(1))Apelin-13 in human cardiovascular tissue. Apelin is an endogenous ligand of the human orphan receptor APJ (orphan G protein-coupled receptor). This peptide is produced through processing from the C-terminal portion in the pre-proprotein consisting of 77 amino acid residues and exists in multiple molecular forms. Although the main physiological functions of apelin have not been clarified yet, it has been demonstrated that apelin partially suppresses cytokine production from mouse spleen and, specifically, induces the promotion of extracellular acidification and inhibition of cAMP production in Chinese hamster ovary cells. Moreover, it is involved in the regulation of blood pressure and blood flow.